Since I have owned two Ultimaker 3 Extended printers in the past several months, I have an almost predictable issue where my first layer is too squished to the bed, causing there to be a minor single layer flare out on the first layer which at times has affected the quality of the surface of many of my prints - especially ones with dual extrusion lettering. I can send pictures if no one is familiar with this, but I have heard of others having the issue (and can't find those references now, of course). I have done countless manual and automatic bed levelings to no avail. Wondering if there is another approach? Maybe be a little looser on the manual bed leveling to the point where I can barely feel the calibration card? Maybe there is a z-offset I could change? The issue isn't a show stopper, but my CR-10 outperforms the UM3E for the quality of the first layer and that feels wrong to me given the quality differences in the two printers. Here are some examples from a print I did in December. 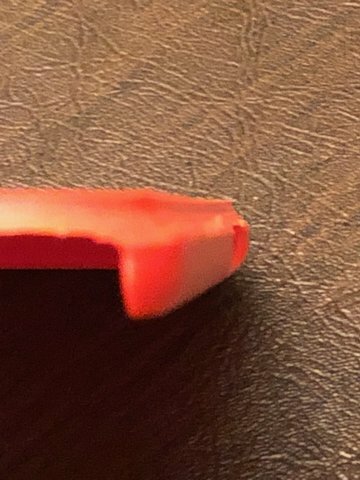 The model was a phone case and the sides were a 45-degree chamfer. You can see, even had I modeled a lip to be more accommodating, I am losing integrity between the lines of the lettering. Short answer: I usually set "initial horizontal expansion" to around -0.25 to fix this. The most common name for this is "elephants foot" or I sometimes call it "micro brim". The problem is that "elephants foot" refers to another phenomenon as well. If you level such that you have no microbrim then your part won't stick as well. This is fine for small parts (less than 3cm in X and Y) but can be a problem for parts >= 10cm in either x or y. And having a part come loose can really cause a major headache and destroy the print head of the UM3 sometimes (that's called a "head flood"). So you can play it safe (recommended) and level the way you are doing now and use "initial horizontal expansion" to correct. Or if you aren't afraid of ruining your print head when the part comes loose you can just level higher up. I never do autolevel and when it's printing the brim or skirt I just adjust on the fly. I turn the 3 leveling screws exactly equal amounts until the brim is .4mm wide (if I want no microbrim) or nicely squished (if I want the part to stick really well). This is very helpful, gr5. Thank you. I get the need for some squish and did know it as elephant's foot. Good reminders. I am comfortable with the adjustments on the fly and will give that a go. I also find it interesting that you don't do the auto bed leveling. That makes perfect sense! I often wondered what good manual adjustments would do, assuming you are in the ball park, if auto leveling would correct your manual leveling adjustments. I will also give the initial horizon expansion a try. Is that set in Cura or on the printer? (I could of course Google the answer, but asking here). 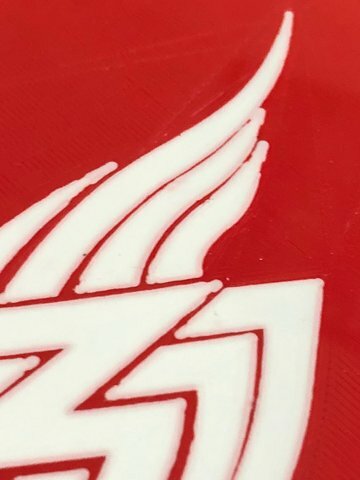 Initial Layer Horizontal Expansion is a Cura setting. It's an advanced one, so you may have to go into the configuration dialog and make that setting visible before you can adjust it in your prints. Thank you. I did find it before and have already done a couple test prints. I try to 0.3 and it made quite a difference. I also turned off the automatic bed levelIng. When using cura I almost never make settings visible anymore - I just type one word in the search box and it shows only relevant settings. So for example I might type "layer" to find and change layer height or "line" to adjust the line widths or "infill" to adjust my infill percentage. There's just too many settings to show them all. And if I want to quickly review what settings I overrode I click the star in the profile/quality area. That lists in italics the things I overrode. I never do autolevel and when it's printing the brim or skirt I just adjust on the fly. I meant to ask regarding the two lines extracted from gr5's reply...do these two go hand-in-hand? In other words, if I set the initial horizon expansion...is it required that I turn autoleveling off? It seems likely that autobed leveling would ignore a setting like initial horizon expansion and make adjustments for the then current spacing when it does the leveling calculations. I am about to run a print with initial horizon expansion set at -0.25 and autobed leveling left on - and wondering if I should expect the same result with the elephant's foot. You will get less elephants foot. Let's say you are printing a 10mm-on-a-side cube. The diameter of the nozzle is let's say 0.4mm. When you look at the cube the X and Y lines on the outer edge of the cube will move 9.6mm because it pulls inward by the nozzle radius. Look at it another way - when "drawing the line on the outer edge" of the cylijnder it is NOT infinitely thin - it is 0.4mm thick. So you have to "draw" the line inward by 0.2mm (actually it pulls in by half the "line width" parameter - not the nozzle radius - but typically these are the same value or close to it). This is also true for example for a circular hole inside your part - say there is a vertical cylindrical hole going up your cube. Now the edge of that circle is also pulled away from the surface by 0.2mm so the diameter of the circle if it was supposed to be 3mm will now be 3.4mm (radius 1.7mm). Now HORIZONTAL EXPANSION. If set to negative value it will "pull inward" even more by that amount. So if horizontal expansion is -1mm that cube edge will have the servo moving 8.6mm instead of 9.6mm. autolevel is unrelated to any of this other than that UM purposely levels things a bit low (for better adhesion). They do this such that where nominally you would expect the nozzle to just barely kiss the glass at Z=0, instead it kisses the glass around Z=0.03 or Z=0.05mm. Personally I like to squish more than that for even better adhesion.